Business communications should be strategic to an organization’s competitiveness, but too often it is just a cost of doing business. That’s the opening line of a new white paper I just completed titled The Big Shift in Communications. The cloud represents something much bigger than Centrex ever did or could, so this white paper takes an objective look at UCaaS – and why it is a game changer. I was pretty skeptical about hosted voice when it first came on to the scene. It was far more limited than premises based solutions, difficult to cost compare and arguably no cheaper, and it was riddled with quality issues. But a few things changed over the years. First, voice evolved to UC – and for many customers the premises based solutions became too darn complex. Unified Communications as a Service (UCaaS) delivers and integrates all those services (voice, IM, video, conferencing, etc.) into a single simple service delivery model. Secondly, the hosted sector evolved. The features became more robust, the phones got smarter, and the administrative interface or dashboard became intuitive. If you wanted all that before, the simple answer generally involved a premises-based box. Beyond the technology something else important has changed: the users. More specifically where and how they work. Hosted services are more aligned – built from the ground-up – for remote and mobile users. As with all disruptive things – the first stage is to be as good as _____ [whatever the old model was]. The second stage is to change the game (the disruptive part) with new rules and expectations. We are well into the second stage – UCaaS facilitates distributed teams, any device/any location/any mode of communications; and organizations with multiple offices can benefit from a single and consistent solution (centralization). We are now entering the third stage – the stage that has me most excited about the cloud, the stage of transparency. My biggest complaint about hosted providers is their lack of transparency. They want their customers to bet their business communications on their services, but usually won’t provide much in assurances or guarantees. I ask providers regularly about this and get nods and smiles. Most of these firms are growing at some 20-30% a year – sounds great, but I’ve been in firms growing at that rate and it is tough. Things don’t get done right, bad hires, bad decisions, and lots of things swept under the rug when no one is looking. Pop quiz: Two seemingly identical providers to choose from, the only real difference is SP-A has measured 6 hours of outages in the past year and SP-B says they didn’t have any – which one do you go with? SP-A! Why? Because outages happen. 100 percent availability is highly suspicious (among competitive offers). The first step in solving a problem is recognizing it, then it takes disciplined measurements and analysis to improve it. This brings me to Simple Signal a national UCaaS provider. CEO Dave Gilbert heard me present some of these opinions at a recent conference and asked me to write them down. The result is the aforementioned white paper available here. The document is not about Simple Signal, it is about the biggest shift that’s impacting business communications since touch-tone dialing. 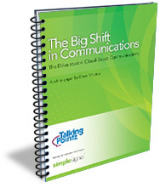 The cloud is at the disruptive intersection of VoIP, BYOD, UC, and collaboration. I am the first to admit UCaaS isn’t for everyone, but it is clearly for a growing part of the market. UCaaS is the only sector of UC showing consistent growth, and that growth is widely expected to continue and even accelerate. Regarding transparency, the third stage, check this out: www.trust.simplesignal.com. Simple Signal is publishing its availability. It isn’t a perfect dashboard, but it is way ahead of the pack. The difference between five nines (99.999% availability or 00:05:35 minutes of downtime a year) and three nines (99.9% availability or 08:46:00 hours of downtime a year) is the difference between a big deal, a new customer, or potentially the very survival of a company. When it comes to betting on a cloud provider, insist on metrics. Check out the paper here, let me know what you think.